Click here to watch the 2012 Sheriff’s Awards Ceremony on YouTube. 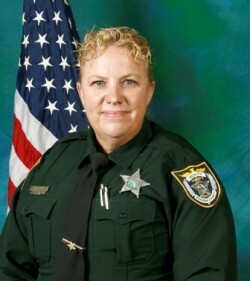 Deputy Barbara Pill started her career with the Brevard County Sheriff’s Office in 1997, fulfilling a lifelong dream to become a Deputy Sheriff. She served in the capacity of Patrol Deputy, Field Training Officer and Criminal Investigator. Deputy Pill devoted a great deal of profession and personal time to helping at risk children and helping senior citizens who had been victimized by crime and dedicated over 30 years of to law enforcement and helping others. As law enforcement officers we understand the importance of our role in society to protect the citizens within our community. We are committed to run into harm’s way and not to retreat. 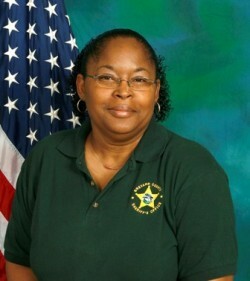 On March 06, 2012, at approximately 1113 A.M., Deputy Sheriff Barbara Pill was shot and killed in the line of duty after stopping the suspects of a burglary near the intersection of John Rhodes Boulevard and Elena Way in Melbourne. She gave the ultimate sacrifice in keeping our communities safe and she will never be forgotten. We honor her memory as we present this Deputy of the Year award to her family. For years now, despite the many changes at the Brevard County Jail Complex there has been one thing that remains constant, the professionalism of Corrections Deputy James Ris. Deputy Ris is the model of efficiency, energy, enthusiasm and effectiveness towards which the other deputies can aspire. 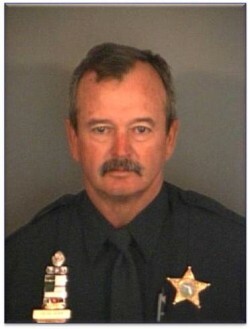 On May 31, 2012, Deputy Ris was off-duty and at his home when his attention was drawn to a commotion in his neighborhood. When a West Melbourne Police Officer arrived on scene shortly thereafter, she found Deputy Ris performing chest compressions on a three-year-old who had been pulled from the water. Deputy Ris identified himself and stated he would continue providing CPR to the child, who has since made a full recovery. In June of 2011, Deputy Ris, along with sixteen other members of his church, traveled to Tuscaloosa as an important part of a community project helping others in need who had lost their homes and everything they owned. The group assisted the town in cleanup and recovery. In June 2012, Deputy Ris traveled to Alabama for the second time, along with members of his church, to assist the victims of the devastating tornados that occurred on April 28, 2011. This trip focused on Birmingham, where Deputy Ris and 26 members of his church worked to rebuild homes for families who suffered such mass devastation and loss of lives. Corrections Deputy Ris is also a canine handler and was instrumental in the recovery of a missing juvenile who was bi-polar and suicidal on May 14, 2012. He was dispatched to assist in the search for the missing juvenile along with bloodhound partners Buck and Gordito. Once on scene, he was informed that the juvenile had been missing for approximately five hours and that a search of the surrounding areas had already been completed utilizing the Sheriff’s Office Aviation Unit with negative results. Buck and Gordito received scent articles belonging to the juvenile, and began tracks three separate times that did not locate the juvenile. At that stage in the investigation, several on scene deputies recommended that the search be suspended because they felt all resources had been exhausted. Deputy Ris did not feel the same way and called for more canines and handlers to assist in the search. Once the additional canines and handlers arrived, Deputy Ris and another canine handler and partner began a new track. When the canine displaying a brief behavior change, Deputy Ris diligently began searching through heavy brush and located the missing juvenile. In September of 2012, Corrections Deputy Ris was promoted to Corporal by Sheriff Parker. This promotion was a result of commitment to his profession, to the Brevard County Sheriff’s Office, and to the citizens of the county we serve. In addition to being selected as the Brevard County Sheriff’s Office Corrections Deputy of the Year, Corporal Ris has been named the Florida Sheriff’s Association’s Correctional Officer of the Year. On April 2, 2012, Communications Officer Davis-Price was assigned to work the South Precinct radio channel when she received a 911 hang-up. Upon calling the number back, she learned that a female was reporting that her boyfriend was intent on committing suicide. During that call, she kept the complainant on the line, continually calming her and managing to gain very specific information on the location and actions of the male. Her efforts to maintain contact with the caller resulted in very important and detailed information being passed to the responding deputies and ultimately lead to a quick and safe resolution of the incident. May 15, 2012, Communications Officer Davis-Price handled a frantic 911 call from the neighbor of a mother who took the lives of her four children and then herself. She obtained all pertinent information, ensuring the deputies were updated with the most recent information. Her diligence and calm demeanor during this tragic event are a true testament to her professionalism and sense of commitment to the agency and the community we serve. In November, she received a call to assist the Melbourne Police Department with a theft case involving a crew known to south Brevard law enforcement as the “cigarette bandits” who had been responsible for thefts from numerous convenience stores in the area. Unfortunately for the suspects, one of them had inadvertently dialed ”911″ on his cellular telephone shortly after Melbourne PD began to give chase. Along with being able to plot the signal location, the team of telecommunicators was also able to hear and capture the spoken words of the suspects as they fled from several different agencies and made their way from south Brevard County into the Rockledge/Cocoa area. This well-coordinated effort among the 911 telephone operators and those working different radio channels resulted in the successful conclusion of this apprehension effort. 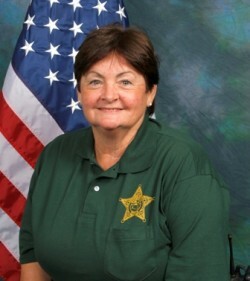 Missy Knight started with the Brevard County Sheriff’s Office in 1990, performing a number of administrative tasks. 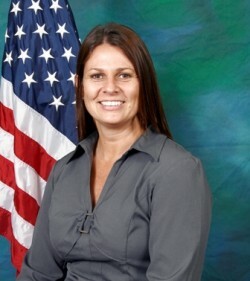 Her career changed in 2001, shortly after 9/11, when the Brevard County Sheriff’s Office realized it needed to expand its analytical and intelligence capabilities and this employee became one of the original members of the Investigative Support Unit. Missy has been recognized countless times for the assistance she has provided to law enforcement agencies throughout the county, state and nation. She is currently an Analytical Support Specialist II with primary responsibilities being to assist the deputies and agents of East Precinct with any analytical needs that arise from their cases, as well as assisting the units in Criminal Investigative Services with analytical support as necessary. Missy was instrumental in closing a more than 20-year-old homicide investigation by providing background on a previously unknown suspect. Although the DNA match was a valuable piece of evidence in the case; Case Agent Martin knew more was needed to bring the case to a successful resolution with the identification, arrest and prosecution of the person responsible for the murder. Agent Martin enlisted Analyst Knight’s help to gather as much information possible on the suspect to include his past residences, schools attended, family members, relationships, jobs held, contacts with law enforcement, and arrests. Over the next several months, before the suspect’s interview took place, Missy worked tirelessly researching and gathering historical data on the suspect. After numerous telephone calls, subpoenas and record request, Missy accumulated hundreds of documents pertaining to the suspect’s past. was shocked by just how much we knew about him. Beginning in 2005, the Brevard County Sheriff’s Office established a very special annual award known as the Lucy Ross Award. Lucy was unfortunately taken from us much too early when she was killed in the line of duty in 2004. Lucy was very special to all of us. One of the ways we celebrate her life is through the recognition of a very special person in the Sheriff’s Office who demonstrates the same qualities as Lucy… qualities such as an unwavering dedication to the community, the attainment of excellence in her profession, and the love of children. There are very few events where you won’t see Mary Moseman’s smiling face. She is one of the first to volunteer for anything that will help a coworker or someone in need. Crew Supervisor Moseman’s experience and maternal instincts aided directly in teaching the Camp Chance kids coping skills such as anger management, conflict resolution, anti-bullying techniques, manners and courtesy toward others. She volunteered for the Shop with a Cop program, helping many of the same kids she helped at Camp Chance to have a Merry Christmas.She collected donated and delivered clothing for the Toys for Tots and Grandparents Raising Grandchildren’s Holiday Programs. She spent Thanksgiving preparing and delivering meals to homeless veterans and their families, enriching Thanksgiving for approximately 350 families. She learned of a homeless family living in the woods in Cocoa and collected food, toys, and clothing, personally delivering them on multiple occasions to ensure the parents and children had the items needed to sustain themselves. She volunteers for the Cocoa Little League, working concessions and soliciting donations and even drives her elderly neighbors to medical appointments and takes them shopping to help them maintain their independence. Due to the illness of a coworker, she assumed responsibility of the Sheriff’s Bike Program program, refurbishing 150 bikes for Brevard Achievement and National Veterans Homeless Support. She has a positive attitude and her compassion toward helping those in need and is truly amazing. Reserve Deputy Gene Hope has shown exemplary performance in both his role as a reserve deputy and as an Agriculture-Marine patrol deputy. While on patrol, Deputy Hope consistently stops to meet with the Agriculture community and quickly responds to any law enforcement needs. Deputy Hope assists with charitable organizations as well as Sheriff’s Office events as a cook.He aids the precincts by backing up calls and in any other manner asked of him. As a reserve ag-marine deputy, he has taken the time to assist each member of the Ag-marine unit with his vast knowledge of Agriculture and assist them in any way possible. While this is expected of Deputy Hope, he seems to go out of his way to help each member of the Reserve Unit & Agriculture Marine Unit and make the unit a fun and productive place for them. Deputy Hope has shown extreme dedication to the department and to the community. 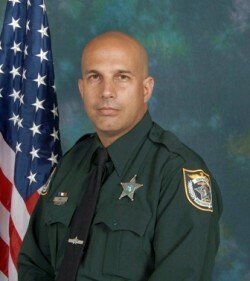 He is an outstanding example of a reserve officer for the Brevard County Sheriff’s Office. The Brevard County Sheriff’s Office Citizens On Patrol (C.O.P.) are second to none. They volunteer countless hours every year and do an amazing amount of work. In 2012, 85-year-old Jack Childs donated more than 1300 hours, an average of 25 hours a week. During this time he patrolled over 10,000 miles in the City of Cape Canaveral. This is an average of over 860 miles a month. In addition to his patrol time he attended nearly every event in which the Canaveral COP Unit was involved. In the summer of 2012, he spent many long hot days at Camp Chance working with the kids. He took it upon himself to work with a local bakery and each week for Camp Chance he delivered fresh donated cookies for the kids. He stood a traffic post at the Cocoa Beach Air Show, Port St John Christmas Parade and the Canaveral 5K Reindeer Run. He was even out before sunrise setting up lighting at the Reindeer Run. He worked with Canaveral Leisure Services at the Canaveral Easter Egg Hunt and the Canaveral Chili Cook off Festival. 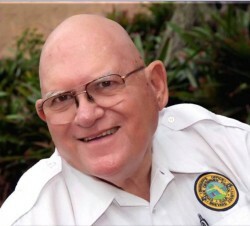 He is always available whenever called upon and he is always eager to assist the Brevard County Sheriff’s Office, the City of Cape Canaveral and its Citizens, no matter the time of day or the day of the week. 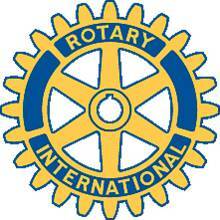 The Cocoa Rotary Club does many things each year to make our county a better place. They are a collective group of citizens that understand the phrase “service before self”. This past year the members of the Cocoa Rotary Club participated in many civic events and contributed to numerous “not-for-profit” organizations but none of their involvement could start to parallel their donation of over a QUARTER OF A MILLION dollars to fund the newest Branch of the Boys and Girls Club that is under construction in Cocoa Florida and will enhance the lives of literally thousands of children in the future. The Medal of Valor is the highest award presented by the Brevard County Sheriff’s Office. It is presented to a member who performs an act of heroism, by putting themselves in imminent danger for the purpose of saving someone’s life. Crew Supervisor Jimmy Fielding Sr.